Don't kill the messenger: the super cheap gas prices may have bottomed out this spring. 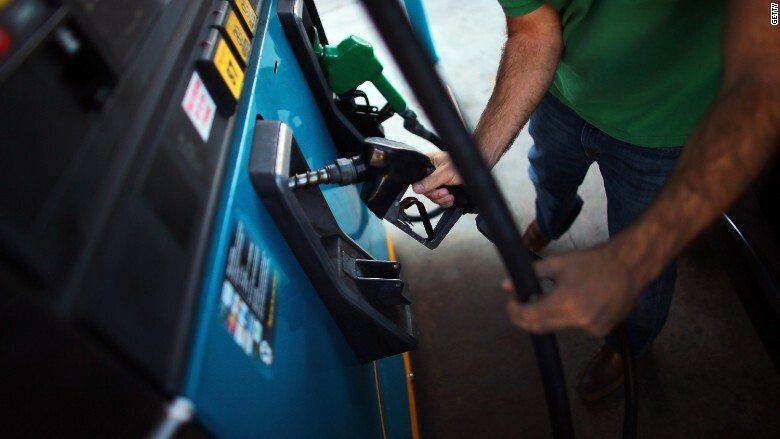 Gas prices rose 10% in May compared to April, the largest monthly jump in six years, according to the Labor Department. Of course, gas prices are still low compared to where they were in the past. A gallon of gas in America was $2.70 a month ago. Now it's $2.80, according to AAA. But that's a lot cheaper than a year ago when it was $3.66. Although drivers might not like the gas price uptick in May, it's an encouraging sign for the economy. A little bit of inflation is healthy -- think of it like good cholesterol. Inflation rose 0.4% in May, its biggest monthly gain in over two years. One month won't turn around inflation, and it's too soon to say "inflation is back." But the inflation pick up is an encouraging sign for American workers. When inflation picks up, wages follow too. Wage growth has been one of the last major economic health indicators that has yet to really turn around. The Federal Reserve is paying close attention to inflation and wages as it decides whether the U.S. economy is strong enough to raise interest rates in September. Fed Chair Janet Yellen said Wednesday at a press conference that she wants to see consistently stronger inflation figures. The Fed targets annual inflation of 2%. At the moment, inflation minus food and energy is 1.7%. That closely watched figure only increased 0.1% in May. A September rate hike would be the Fed's first since the financial crisis, and a major vote of confidence on the U.S. economy's health. Despite the inflation uptick, there was some good news for meat lovers: the price of bacon dropped 17% compared to a year ago.